The Perry Committee on equal IDF service for all on Thursday filed its recommendations with the government. 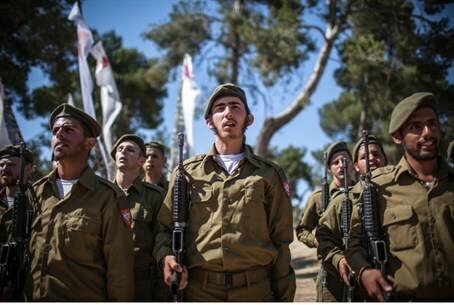 The recommendations include a series of policy ideas and proposals for changes in legislation, to encourage all segments of the population, including the hareidi Jewish sector, to serve a full or partial service term in the IDF. The recommendations come in the wake of the striking down by the High Court last year of the Tal Law, which had been the basis of arrangements to provide exemptions from IDF service for yeshiva students and provided for their gradual absorption in the IDF and the work force. It was contested by a secular group who said it was not egalitarian. As had been discussed in recent months, the law proposed by the committee would allow for up to 1,800 top yeshiva students to remain fully exempt from service for as long as they were in yeshiva. Others would be drafted at age 18, at which point they could join one of a number of programs geared to religious and hareidi soldiers, like the Nachal Hareidi units. With that, individuals will be able to postpone their service to age 21. Individuals who do not report for the draft will be criminally prosecuted. Yeshivas that encourage their students not to register for the draft will be punished by losing their state funding, while yeshivas with a high percentage of draftees will be rewarded. In addition, the committee proposed changing legislation that would shorten service for all male soldiers to 32 months, and lengthen it to 28 months for female soldiers. In recent days, lay and rabbinical leaders of the hareidi communities reiterated their opposition to the mass drafting of yeshiva students, and emphasized to students that they should not register for IDF service, regardless of the consequences.